Is usable by most mobile phones. Uses heuristics giving pertinent answers to current questions. 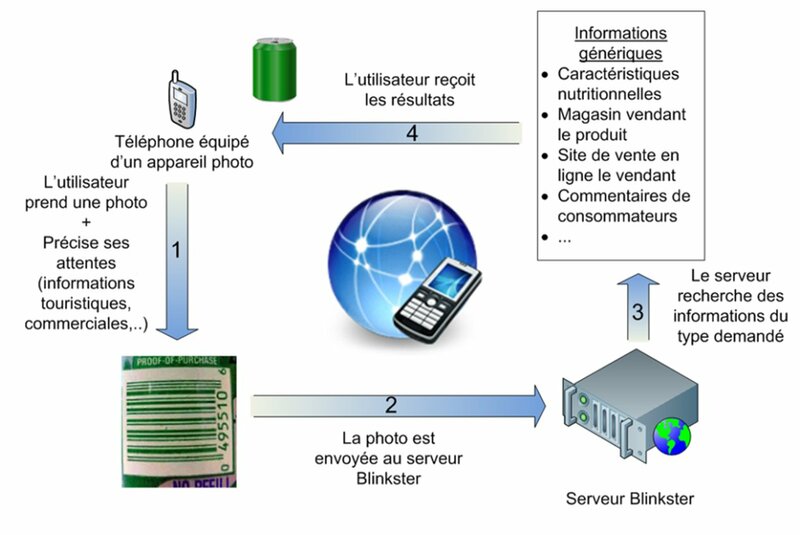 The Blinkster system is composed of both a client application on mobile phones and a hosted service that interfaces with other Web services. The user can take a photograph with his mobile phone and choose a research scenario. He then receives in return a list of results corresponding to the photo and the chosen scenario. On a mobile phone, the interface is extremely simple and intuitive: When the application is opened, a window appears with a video excerpted from the camera application, and some buttons representing the research scenario to be used. These buttons trigger the taking of a snapshot, then send the request to the Blinkster server. To refine the search, information from captors available on the phone (GPS, geo-localization, user language) are sent at the same time as the photo and the scenario type. The image is then sent to the Blinkster servers, which analyse, extract key-words using recognition algorithms (comparison of images and logos, barcodes, OCR), and then use these key-words to research pertinent results for the user, using heuristics combining appropriate service content and existing external web services. The results are presented in the form of a structured list adapted to the format of the phone. To improve user comfort, the button display representing the different available scenarios can be customized. This approach is based on a single, natural gesture on the phone, aim/click, without any intermediate manipulation. It is a pragmatic approach: what the user sees can immediately and precisely be associated with structured content. Optionally, the user can contribute by adding to the Blinkster contribution base. This contribution takes the form of a text message (and eventually a rating) entered on the application’s main menu of the application. This contribution is stocked by Blinkster and indexed with the key words found on the photo. It will then be made accessible to all users. Various points of interest in the user’s vicinity. The Blinkster project is made up of two aspects: server and client. The Blinkster project will initially be stored on two mobile platforms. To work in optimal conditions, Blinkster software necessitates a phone equipped with a camera and an unlimited 3G connection.Taking these factors into account, it was decided that the priority would be to bring ths Blinkster application to iPhone and Android. The iPhone application needs an iPhone 3G or superior, equipped with a 3.1+ version of the system. The Android application needs a mobile phone equipped with a 1.5+ version of the Android system. The Blinkster application needs 10Mo of free space on the phone for installation and archiving the search history for an offline or off-cover consultation. The Blinkster server platform requires a cloud-computing platform.